Good Thursday Morning folks!......well we will have a wave flowing over south florida thru this weekend,rains should start in south florida today and spread up thru central florida over the coming days...good luck folks on getting some rain,boy I sure can use some here by me...well Blogs COFFEE is set to perk for when You get here..enjoy...have a great day everyone!...and I see the death toll over in California has risen to 23 now..and a lot of folks have been injured from all those fires there,a terrible time for them there to be sure huh. should remain aware of water levels. Scattered to numerous thunderstorms are expected through the week. conditions for small craft operators through Saturday. be ready to move to higher ground should ongoing flooding worsen. Good morning... and so the rain has begun. BillsfaninSoFla wrote: Good morning... and so the rain has begun. good morning billsfan,ok..if driving be safe ok,several days of this rain ahead down there. 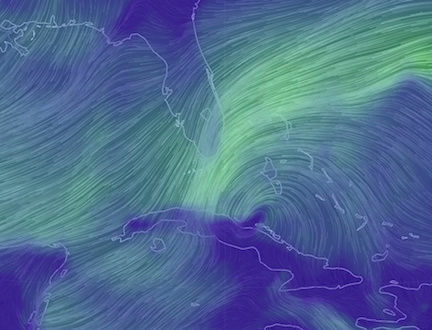 Looks like there is a little circulation down by Cuba. What, too soon? so far it seems like the actual LOW will be going thru the straights st.pete..so far no development for it on the model runs. well not a cloud in the sky above me here,maybe later today or tonight,and the sun sure is Bright whew..sun glasses on for sure. almost 1 30pm thurs and I just checked the models and other than a wave or two bringing rain, I don't see anything really tropical storm wise thru the 28th...but this month and next we need to watch the gulf for any surprise LOW's that come with the tail end of the fronts out there. For sure. I don't remember the skies being this clear in awhile. From this view you can see the pilings going in for the new pier (center right). Good afternoon. Been working OT this week so haven't been able to check in much. Heck, I've barely had time to check my weather forecast. Been quite warm here with highs between 85-90 with lows in the 70's. Jax extended forecast has temps lowering. 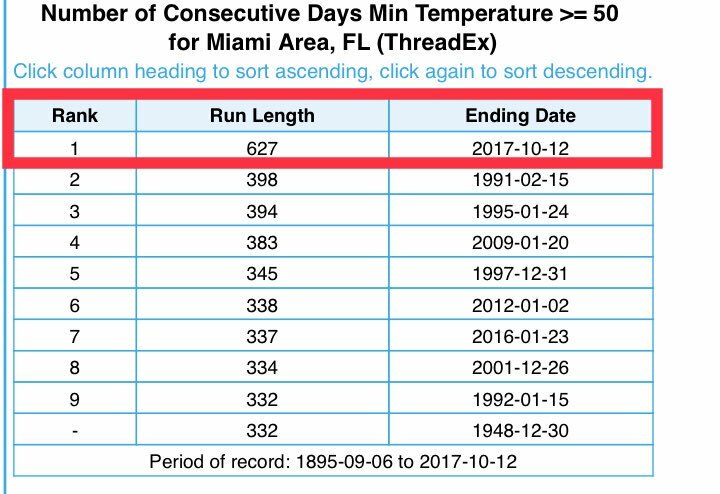 Perhaps more fall-like weather will settle in (at least in North FL). We shall see. tonight over the offshore waters. 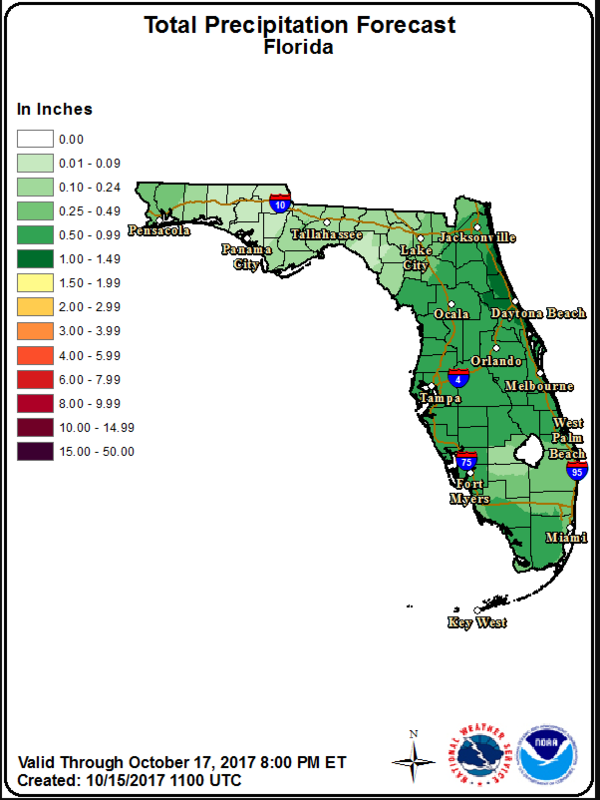 move to higher ground should ongoing flooding worsen. with the shower activity over the Atlantic waters. drainage areas along the east coast metro areas. Atlantic beaches through the weekend. occasional lightning strikes will remain the main threats. Good Friday Morning folks and TGIF! !...well it seems rain chances go up today for most of us,and thru the weekend too..be careful driving especially in south florida,heavy downpours possible they are saying..well I have lots to do today..Blogs COFFEE is perking for when you get here..enjoy...have a great day everyone..
well, knock wood, we have a break in the rain. Having guys try to knock some work out! BillsfaninSoFla wrote: well, knock wood, we have a break in the rain. Having guys try to knock some work out! ok good luck down there..doesnt seem like the rains are all over the place like yesterday..lets see later this afternoon..tomorrow and sunday are supposed to be the heavier rain days..especially Saturday. 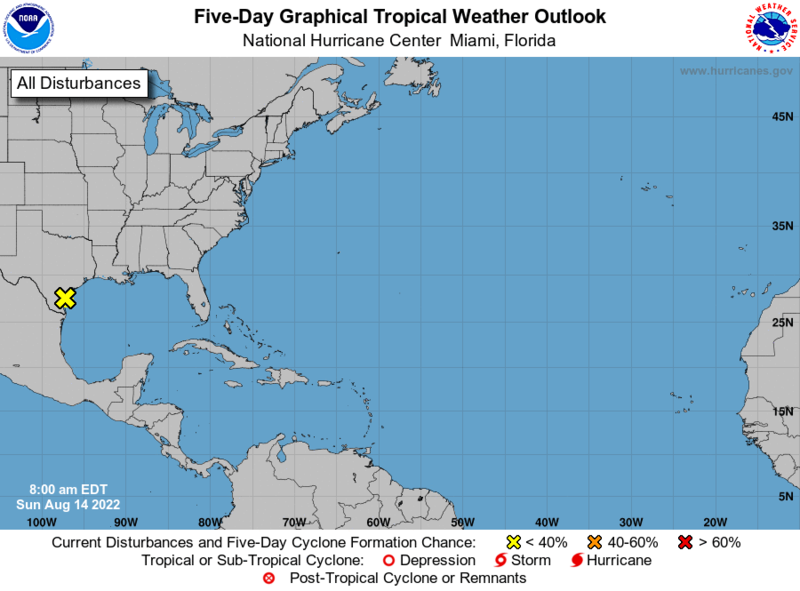 lets keep an eye on this one..until it passes florida going NW..
LargoFL wrote: lets keep an eye on this one..until it passes florida going NW..
begins to move northward over the west-central Atlantic Ocean. periods of light to moderate rainfall. scattered showers and perhaps an embedded thunderstorm or two. coastal lows remain in the mid to upper 70s. hmmmm highs in the 70's...enjoy gome when it reaches your area. lower 80s with lows generally from the upper 50s to lower 60s. It turned out to be a nice (although very hot) day. BillsfaninSoFla wrote: Thanks for the updates Largo. 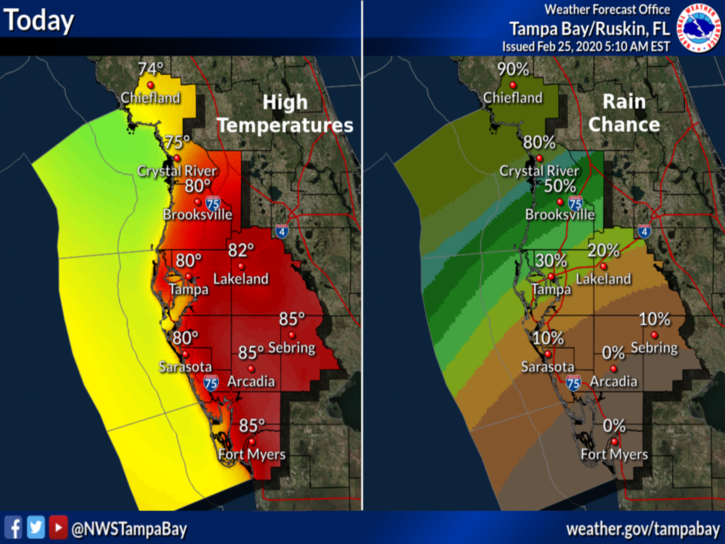 Good Saturday Morning folks...looks like better rain chances today,especially I-4 southward..good luck folks..have a great day everyone. Morning. I'm liking the forecast here the next week. Highs not forecast to get over 85 with a day or two possibly in the 70's. Also some chance of rain most days. And there'll be a nice breeze from the east. Should make for comfortable outdoors conditions. Sounds great Aug. I can't wait until we get that first fall like day. BillsfaninSoFla wrote: Sounds great Aug. I can't wait until we get that first fall like day. Hurricane Ophelia is headed to Ireland. Very strange. It's a cat3 at the moment but should weaken some before impacting them. Thanks, Largo. A good 1/2" over 2 days -- small fast showers. Good enough for the week, as long as the sun doesn't come out a-blazin' in the next few days. Nice temps Aug and of course Gomey. Hopefully our forecast verifies. 86-87/70 later in the week. Those will be some nice mornings. I sure hope the 90's are gone for a while, and the 60's start popping up. yeah I got .20 in the last 24 hours..guess they lose their energy coming across the state...got a real fast sprinkle here a few hours ago..suns back out and man it sure is Humid here whew...lets see what tomorrow brings,rain wise as that wave crosses the state..should be over by Monday they think....I cannot wait..for high temps to be in the 70's again LOL..this summer sure was a Hot one huh. Good Sunday Morning folks!..well another day like yesterday..some Possible showers this afternoon here..only got a quick sprinkle by me yesterday..good luck to those who get some today.......have a great day everyone! Good morning. Can we make it Saturday again? I'm not ready for the weekend to be over yet. Looks like Tuesday into Wednesday will be quite wet here with 1-2" in the forecast. 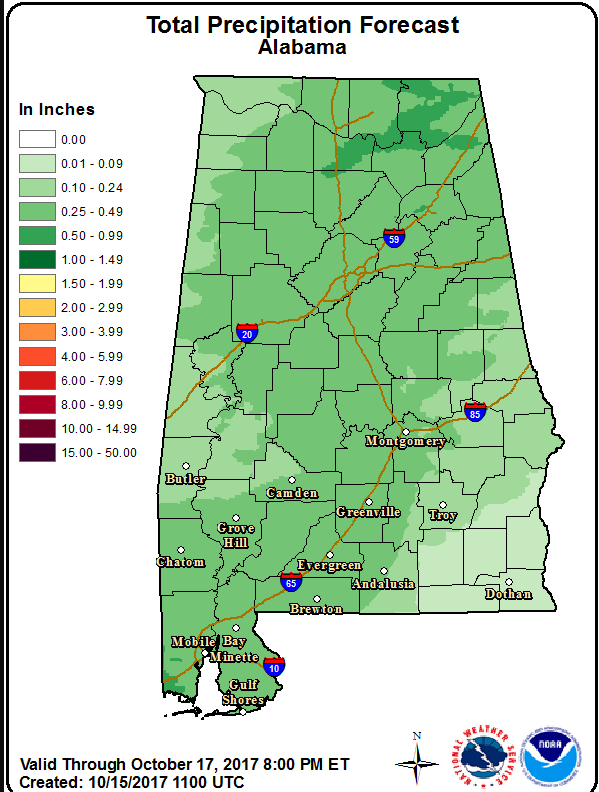 Rainfall forecast for Florida and Alabama though Tuesday evening. StAugustineFL wrote: Good morning. Can we make it Saturday again? I'm not ready for the weekend to be over yet. 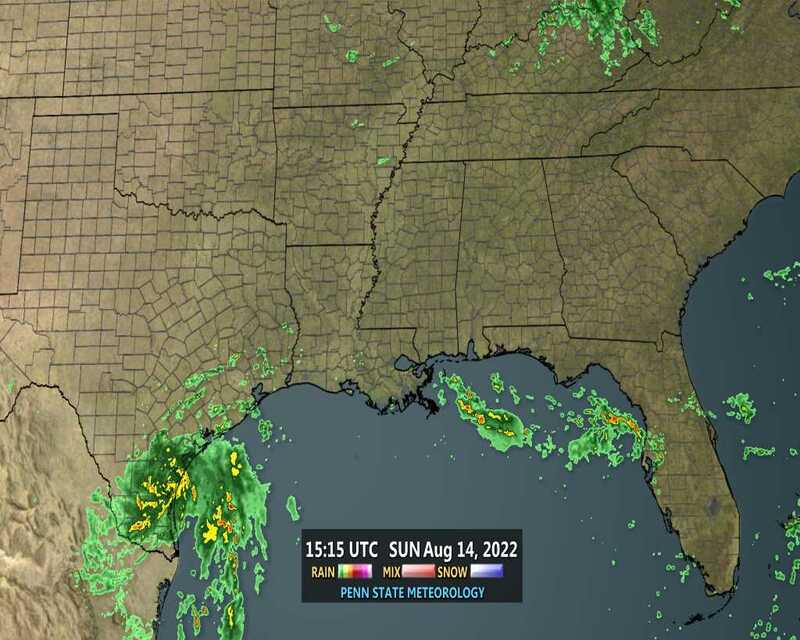 good morning Aug,yeah you may get some heavier rain from the front,good luck, hope it drops your temps some..local met thinks it will fizzle out down here. Ditto Aug. Where do the weekends go? No clouds at all today.